Noizepunk and Krooner Show #25 is available! The Latest Noizepunk & Krooner Show! 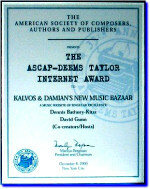 To all visitors: Kalvos & Damian is largely a historical site reflecting nonpop from 1995-2005. Our RSS feed will inform you when new content is added, including both the monthly Noizepunk & Das Krooner shows, and interview transcripts that are now being posted. For more information, please visit this page. We will resume Kalvos & Damian online radio shows on an irregular basis in 2008. Dennis is 75% through his "We Are All Mozart" project. Nearly 70 new pieces composed in 2007. Go download scores & listen. Komposer Kombat archive is great to hear! Listen to the results of the kompetition, read about how it happened, and listen to the whole show (#537) in its entirety! More than 40 new pieces were created for this event, and premiered in preliminary rounds and the finals were broadcast on the show from Studio Z. Yee-hah! We talked with the performers -- Amanda Baker, Carla Parodi, Lydia Busler-Blais, Lucy Yates and Lisa Jablow -- and other composers -- Rob Voisey and MJ Leach among them -- and had a rollicking time to end our run on the air! RW/PJ: Please contact me with functioning email or phone number. Your email is bouncing and you did not leave a number to return your call. Another New Noizepunk & Krooner Show! Show No. 18 Noizepunk & Das Krooner! with Judith Lang Zaimont is now posted! Nothing like N&K to get into spring! Get 'em now! Two New Noizepunk & Krooner Shows! Show No. 16 and 17 of Noizepunk & Das Krooner! with Luis Andrei Cobo and Beth Anderson (former K&D guest!) are now posted! Nothing like N&K to overcome that cabin fever! Get 'em now!